The following are some uses for common witch hazel that include some unusual applications. Witch hazel is an astringent made of the bark and leaves of a common North American tree. It is traditionally used in the treatment of a number of conditions related to bruising, swelling, broken capillaries and irritated skin. But, it has other uses, as well. It is widely available at pharmacies and department stores. Historically, barbers have applied witch hazel as a gentle, moisturizing aftershave. Witch hazel is a natural astringent that closes pores and gives the skin a fine, smooth appearance. It soothes razor burn and speeds healing. Similarly, apply witch hazel to skin that has been over-exposed to the sun. It has a cooling and healing effect on sunburn, rashes, hives and other skin irritations. Compresses of witch hazel can be applied to bruises to heal them quickly and reduce swelling. For relief from varicose veins or hemorrhoids, apply witch hazel to the affected area. 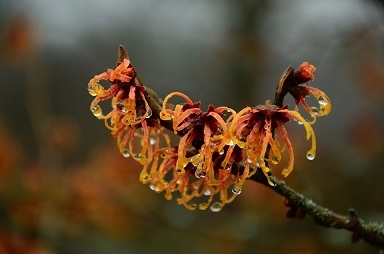 Apply witch hazel frequently to new body and ear piercings to keep them clean, soothe inflammation and speed healing. If nail polish won’t adhere to fingernails properly, an application of witch hazel before applying the clear foundation coat will easily redress the problem. Please, see this tutorial. Moisten a cotton ball with witch hazel and apply it to each nail. Allow the witch hazel to dry. Then apply polish as usual. Nail polish should last about a week under normal circumstances. Restore old furniture finishes that have become “crackled” by applying witch hazel to the surface. Allow witch hazel to remain until a smooth finish is achieved. Disclaimer: The information in this article is not intended or implied to be a substitute for professional medical advice, diagnosis or treatment. The author is not a doctor and makes no representation and assumes no responsibility for the accuracy of this information. Never disregard professional medical advice or delay seeking medical treatment because of something you have read on the internet. The author does not recommend, endorse or make any representation about the efficacy, appropriateness or suitability of any specific remedies or procedures.